A separate arm of Lockheed Aircraft, LAS operated from Ontario, California, and specialized in the conversion of airframes. In the late 1950s, the company created the Super 26 which utilized just the wings, engines, tail, and landing gear of the Invader. A new fuselage with a pressurized cabin that was 22 feet long and six feet high was built and this could carry six-to-nine passengers. Constellation windows and cockpit sections were utilized and the first example, N5052N, flew in mid-1960. Apparently only one was built and the hulk finally wound up with Air Spray in Canada as a parts source. The above shot shows N5052N, s/n 44-35994, when the plane was at Spaatz Field, Reading, Pennsylvania, on 29 September 1968. At that time it was owned by Mesta Machine Co. of Pittsburgh. 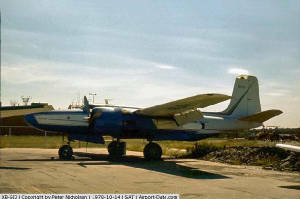 The Super 26 utilized just the wings, engines, tail, and landing gear of the A-26 Invader. A new fuselage with a pressurized cabin that was 22 feet long and six feet high was built and this could carry six-to-nine passengers. Constellation windows and cockpit sections were utilized and the first example, N5052N, flew in mid-1960. Apparently only one was built and the hulk finally wound up with Air Spray in Canada as a parts source. Increased interior height by raising the fuselage top ( looks like a foot above the normal A-26 ) - and - deepening the belly ( by 6 to 9 inches - starting with a fairing at the nose landing gear well / forward bomb bay lower-partial bulkhead ) carrying this height section aft to the break in the parallel longitudinal reference ( tapering to the tail ). Increased the interior cabin length by adding what appears to be a 6 foot " plug " in the fuselage aft of the wing. This configuration is remarkably similar to the L.B. Smith Tempo II conversion design. With the incorporation of the " ring spar " to replace the rear wing spar carry-through structure, the interior would be open from the rear face of the forward wing spar, all the way back to the rear pressure bulkhead ( behind the rear-most cabin side window ). LAS was said to have used Constellation L-1049 Super G cabin windows in conjunction with pressurization. These can be identified by the square shape with generously rounded corners as seen on the aft fuselage ( 4 on each side, includes the entrance "Airstair" to starboard and the escape panel opposite ) and the pair below the right wing. The oval windows above the wing appear to be horizontally sectioned from the side window size. The cockpit windshield appears to be the normal A-26 curved units but with small cockpit side windows, both incorporating heavier framing to withstand pressurization loads. This configuration can also be found on the L.B. Smith Tempo II conversion. A newly designed fiber glass nose with considerable length and contour revisions over the standard A-26. The added length of the nose was certainly increased to compensate for the added fuselage length aft of the wing. This would bring the C. G. back to the correct location and aerodynamically improve the shape. An added benefit would be an increased capacity to carry luggage and baggage in the nose along with the aft compartment ( note the small open doors on the right side, nose and tail ). A half-dome transition shape to the aft end of the cabin top to blend with the standard A-26 tail section. Note how the vertical stabilizer leading edge blends into a horizontal dorsal spine, ending at the half-dome transition. These shapes can be found on the On Mark Marksman " C " configuration. As the LAS Super 26 preceded the Marksman series, it seems that there were many design elements used by the various conversion companies, especially those operating from the San Fernando Valley area of California. It must be noted, however, that On Mark Engineering dominated the A-26 Invader conversion business, and was successful beyond measure compared with their competition.